Just wondering if anyone is using this tent and what they think about it? Went and had a look at them and they cool. Took the guy about 20 secs to put up. Most impressive!! anyway yes they are extremely quick to set up but realy once you peg it down and make the varander etc it isnt that much quicker. however the build quality is the best in a on the ground tent in my opinion. with the metal frame. Seems to me that this was a pretty well thought out range of tents. I like the idea of being able to get factory made side/front curtains for the awning and they make a custom made ground sheet for the tent/annex although i will probably get the cgear ground mat. LOVED how easy it was to put up!! Bloody fantastic . That RV-1 is exactly what I need for the Justy I may purchase one of these later on. My pup tent works well for now. I bought an rv4 last summer and it is brilliant. I was looking at roof tents, but my wife wasn't keen so we looked at these. As already mentioned they are great quality and really are easy to put up after a long drive when all you want to do is sit back and enjoy. Only down side may be the length, but as long as you can put it on your roof then not a problem. Definately water proof. Stopped in mine on Tuesday night, we had 20mm of rain over night and not a drip to be seen. I need to do some converting and measuring but I am thinking just by the size in the pictures it should fit the roof rack when needed. Is this for you to sleep in or the Justy?? Who would have thought of a portable "carport" for when you're out and about! 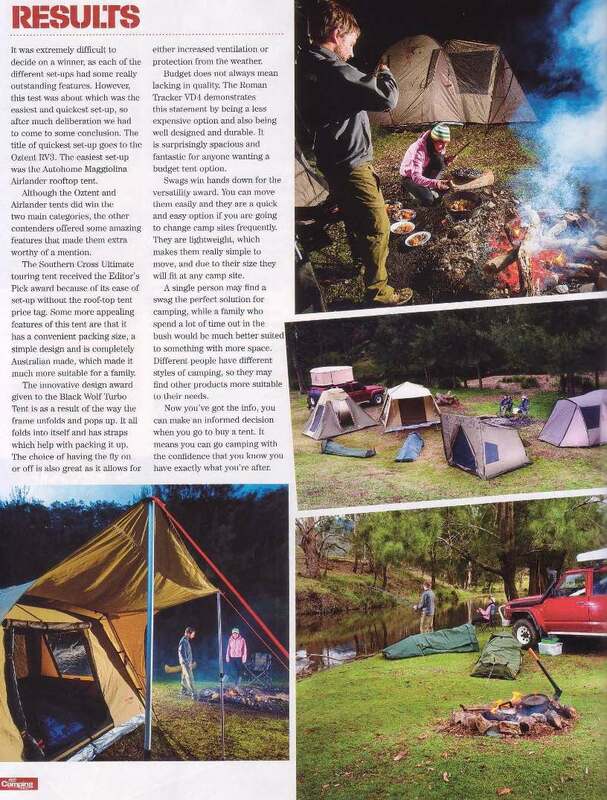 In some mag I have at home (i think its $WD camper trailer or somthing like that), there is a review of various types of tent, including this one. Incidentally, I have one of these, but I only tend to use it for stays longer than one night. I use my hiking tent for short stays. having said that, it is a bloody excellent tent. have had it over ten years and it is bomb proof. It would be for me though. I have a small Coleman pup tent that I use all the time, but I am thinking the wife and dog would be more cozy in one of the RV-tents. here ya go: the bottom line from "Camping with your 4wd" issue no 10, review of tents. The southern cross tent that won "Editors Choice" is in the middle right pic, closest tent to the red patrol. They said it took 1 min 29 secs to put up. the Oz tent they say took 39 secs to put up, and was the quickest set up. even dome swags took longer. But I reckon if the southern cross appeals to you, get a freedom tent instead.